Whisky writer Dominic Roskrow remarked that marrying smoky, peaty flavors with sherry finishing is a tricky thing. He covered the Lahproaig line for his book 1,001 Whiskies You Must Taste Before You Die and mentioned this in his write up on Laphroaig Triple Wood. If we are talking about heavily peated whiskies it’s not hard to imagine the difficulty of integrating highly contrasted flavors such as sherry wine finishing. In my own experience, sherried whiskies with light peating tend to work very well, but not a lot of the reverse that I have tried. One comes to mind, Bowmore 15, which was a complete mess. Achieving a sublime balance of peat and sherry may ultimately be a matter subject to the taste of the drinker, and if so, who really cares. If you like it, you like it. 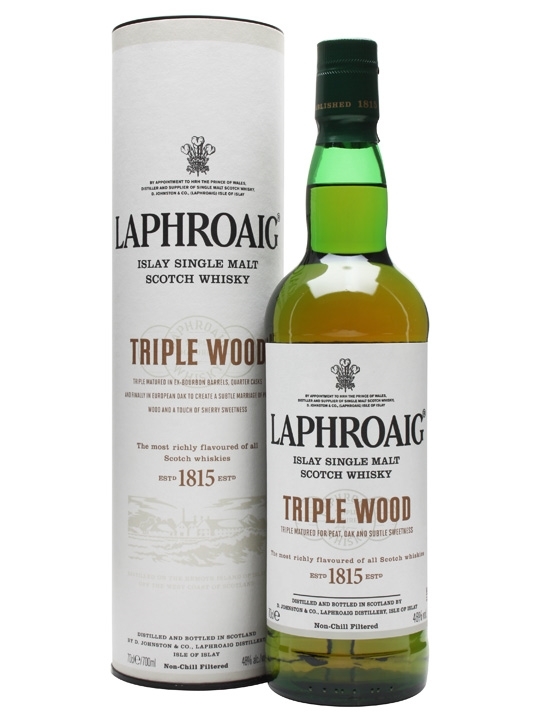 Let’s look at one such example in Laphroaig’s Triple Wood. Nose- Typical Laphroaig assault but now burnt toffee and faint vanilla. Salted caramel, damp moss. Snuffed out bonfire. Smoked berries. Ashy. Damp beachwood. Pipe tobacco. Taste- Sweet at first but turns sour, citrus and smoky. Lemon butter. Earthy and thick. Finish- Long, smoky. Sour lemon rind and charred oak. Tobacco pipe. Bitter, drying. Comments- Interesting idea but unbalanced and disjointed. Flourishes of good things but overall not enough to justify the $30.00 increase over the 10 year. The Laphroaig that is most unlike the others.